Hand-In-Hand Early Years Nature Education Program is an outdoor educational program, located in the Comox Valley and Campbell River, that is designed to offer a unique early childhood learning experience for children aged 2-5 years (2 year old children must turn 3 years old by December 31st of the school year that they are registered in). Our classroom is the natural environment. Our chairs are the logs, our pencils are the sticks and our possibilities are endless! The program is offered Monday to Friday from 9am to 12pm, outside, as this is an environmental educational program. If there is severe weather, it may be necessary to use The Cultural Centre (for our Cumberland location), the Comox Community Centre (for our Comox location) and the Sportsplex (for our Campbell River location). Our programs are facilitated by two certified and experienced Early Childhood Educators that will teach a maximum of 16 children. Expanding on the BC Ministry of Education’s Early Learning Framework, the emphasis of our program will be on a child-led, nature and play-based curriculum and will encourage preschoolers to engage with their environment through art, music, games, physical activities and group learning. 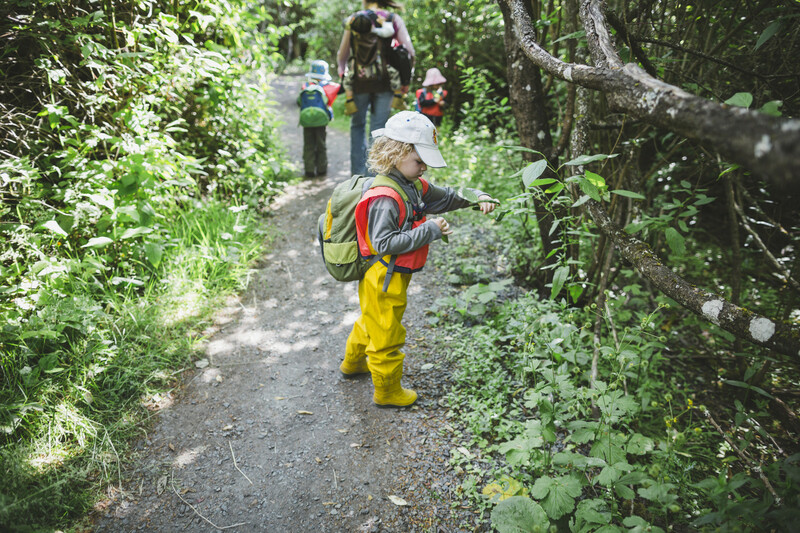 Our model for our nature educational program is comprised of two components: Ecology and Adventure Education. Ecology – The Ecology component of our program focuses on becoming creative interpreters through the exploration of nature trails. This allows the individual student the time and space to quietly experience the sights, sounds and smells of the natural world and then to express these feelings through drawing, song and dance. Birds will be viewed through binoculars, sea creatures through nets and plants through magnifying glasses. Throughout the year we will explore, question and interpret through sensorial play and meaningful encounters. We will follow the interests of the children, value their passions, ideas and individual learning styles, and provide an experience to encourage developmentally appropriate in-depth learning. Adventure Education – The Adventure Education component facilitates personal and interpersonal growth (communication, problem-solving, trust-building, risk-taking and cooperation) and is instrumental in the practice of SEDL skills (social, emotional, development and learning). Through hands-on activities, such as team building and group cooperative games, children are able to expand on their development in communication, cooperation, trust and problem-solving skills in an atmosphere that is safe, respectful and fun. Children are guided in making connections between these activities and “real-life” situations. Families report a positive impact on home climate, child performance and interpersonal dynamics when these activities are reinforced in the home.